Mark is the chief architect and lead software engineer of the CompuMove System. 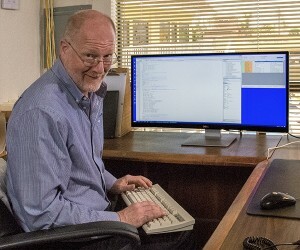 He wrote his first computer program at age 16, and has been programming ever since. He holds a B.A. in Economics with an emphasis on Accounting, and has been actively involved in the moving and storage industry for more than 30 years. Mark is expert in application programming, SQL database programming, and internet/cloud program integration. Mark’s combination of computer and accounting skills, and his deep understanding of our complex industry, make him uniquely qualified to fill this role. When not programming, Mark is an avid ice hockey player, woodworker, mountaineer, and husband and dad.